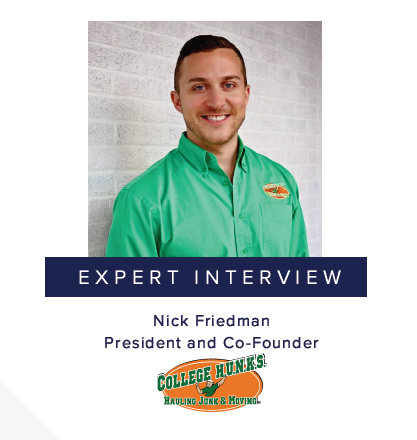 Nick Friedman is President and Co-Founder of College Hunks Hauling Junk and College Hunks Moving, the largest and fastest growing junk removal and moving franchise opportunity in North America. Nick started the business in college with his childhood best friend, now business partner, Omar Soliman in a beat up cargo van, and has grown to over 100 franchises nationwide. He has since been named among the Top 30 Entrepreneurs in America Under 30 by INC Magazine and was named on the same list as Mark Zuckerberg, as one of the 30 Most Influential CEO’s Under 30 by Under30CEO.com. Nick is also a two-time Ernst and Young Entrepreneur of the Year Award Finalist. Customer Management Practice's Principal Analyst, Michael DeJager, speaks further with Nick about his unique philosophy, career journey and deep passion for customer experience. To get a copy of this interview to be sent to you directly, contact us.